TYPES OF COMMERCIAL FISHING VESSELS – QUEEN CHARLOTTE SEAFOODS LTD.
Trollers are easily identified by the long poles and hydraulic “gurdies” they use while fishing for salmon. Lines fitted with leaders and lures are paid out and trolled behind the vessel. Gurdies retrieve lines from the water, and each hooked fish is removed and handled individually. 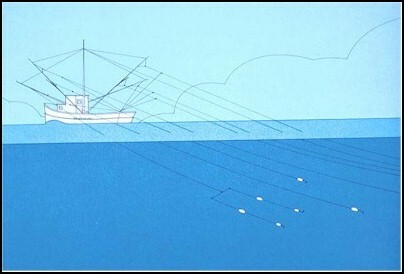 Be conscious of the lines, supported by a float (called a pig), which can extend a considerable distance out and behind the vessel. 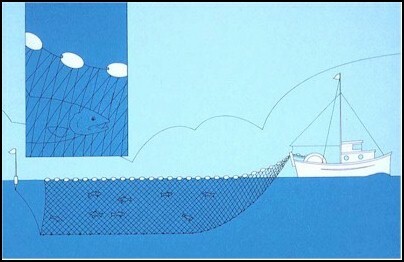 Gillnetters are smaller commercial fishing vessels with a net suspended in the water by floats and a lead line. 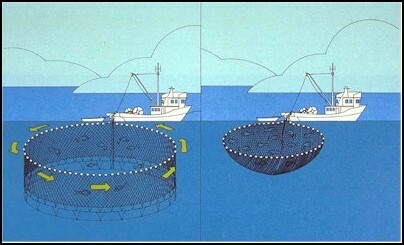 Entangled fish are removed as the net is hauled in on a drum. Gillnetters often drift with tides and currents. Be conscious of the large floating buoy or at night, a single white light, that marks the trailing end of the vessel’s net, which can extend as much as 550 m behind the vessel at about 10 m in depth. Corks may be difficult to see in choppy waters. Seiners – the largest commercial fishing vessels in the salmon and herring fisheries – have a large hydraulic boom and a take-up drum mounted aft. Be particularly careful of fixed beach lines while in the vicinity of seine vessels. These vessels do not have the ability to maneuver easily and sport fishers should make way.